Learning Resources Partners with family financial expert Erica Sandberg. The Dollars and Sense Campaign will teach math and money skills to kids through Play. Learning Resources, a leader in the educational toy space since 1984 and family financial expert Erica Sandberg have joined forces for Financial Literacy Month. Their Dollars and Sense campaign is designed to help educate parents on how to teach children about the basics of identifying, counting, sorting and saving money as Tax Day approaches on April 18th. Together they are releasing tips for teaching kids about the importance and value of money through play during the month of April. The goal of the Dollars and Sense Campaign is to build awareness of the importance of teaching kids about money early on as a foundational life skill that can continue to grow with and benefit kids throughout their lives. The campaign includes a Facebook Live session Thursday, April 13th at 6pm Central at https://www.facebook.com/learningresources and nationwide partnerships with teachers and influencers to give away money related toys and copies of Sandberg’s new book. “Learning Resources believes in the natural curiosity of kids - our money focused toys allow kids to pretend to check out at the store, go to the bank, or set up a shop and make change, wherever their imagination takes them,” said Marie LaPlante, Chief Marketing Officer for Learning Resources. “We believe a hands on experience makes it fun to interact with and learn about money”. 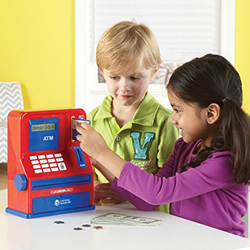 Learning Resources has many toys that teach children about money, such as their award winning Pretend & Play® Calculator Cash Register, the newly released Pretend & Play® Teaching ATM Bank, Pretend & Play® Play Money, a Money Activity Set, and Smart Market. Sandberg’s book,Expecting Money: the Essential Financial Plan for New and Growing Families, is the first and only to specifically address the unique financial hopes, costs, and concerns of parents-to-be. Expecting Money is scheduled to re-release in April and will be available on Amazon. About Learning Resources: Learning Resources® is a leading global manufacturer of innovative, hands-on educational products trusted by teachers and parents and loved by children. The Company's 1100+ high-quality products are sold in more than 80 countries, serving children and their families, preschool, kindergarten, primary, and middle-school markets. For more information, visit http://www.learningresources.com, or follow us on Twitter @LearningHandsOn, Facebook @LearningResources and Instagram @learningresources.